Great Display!!! Fast Delivery!!! Highly Recommend!!! First time getting a display box, and i loved it. I can't complaint, I recommended. After buying the first one i had to buy another one, (for my 2nd baseball that i gotten) thank you guys a lot. Bought this item for a special baseball. It makes the ball stand out on the shelf. Perfect. Nice display case with a classy look. Good for those single balls you just want to shine. 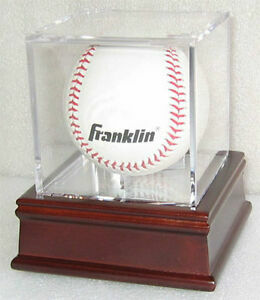 It is a nice way to display our autographed baseball. The base is a nice color wood. This case is exactly what I need to house my signed baseballs. I can now display them without fear of the signature fading.